This Jan. 19, 2012, file photo reviewed by the U.S. military shows the front gate of "Camp Six" detention facility of the Joint Detention Group at the U.S. Naval Station in Guantanamo Bay, Cuba. The Trump administration is weighing a plan to send hundreds of captured ISIS fighters to an Iraqi prison after other countries refused to take them, and to send several of the highest-value fighters to the U.S. detention facility in Guantanamo Bay, five U.S. officials and two European diplomats told NBC News. The possible Guantanamo detainees include two ISIS fighters who participated in the murder of Americans and other Western hostages, say five U.S. officials. Alexandar Amon Kotey and El Shafee Elsheikh were members of a group of four jihadis dubbed "The Beatles" by observers because of their British accents. Detainees sent to Iraq would be held in Iraqi prisons with Iraqi guards, but the U.S. might retain the right to prosecute them if they could not be sent to their home countries, said officials. 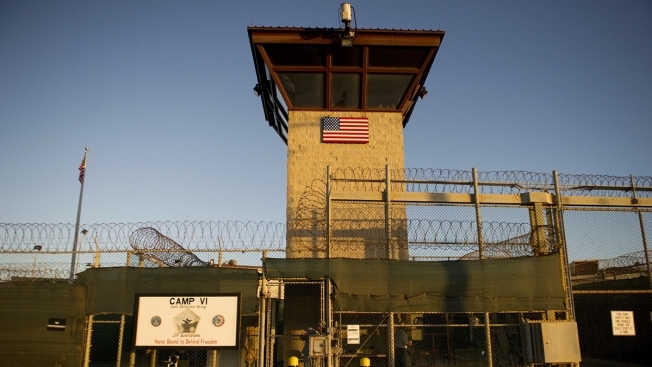 Democrats in Congress and human rights groups oppose sending new detainees to Guantanamo and say those ISIS fighters suspected of murdering Americans should be tried in federal court, where they could be held accountable instead of held indefinitely without charges. A spokesman for the National Security Council declined to comment on options for detained foreign fighters or the "disposition of specific cases." The State Department would neither confirm nor deny that such a move is among the options the administration is considering.